What is the purpose of flexor tendons? How many flexor tendons are there? Why are there two flexor tendons in the digits but only one flexor tendon in the thumb? What makes a flexor tendon injury so particular? How can I identify an injury to the flexor tendons? The purpose of flexor tendons consists of the power transmission from the muscles located in the forearm to the digits or the thumb. When contracting the flexor muscles in the forearm, the digits will be brought into a flexed position (thus the term flexor tendon).When contracting the extensor muscles or tendons, the digits will be brought into a stretched out position. When contracting the flexor muscles on the forearm the muscles will decrease in length. The motion resulting thereof will be transmitted to the digits through the flexor tendons. All digits dispose of two flexor tendons; the thumb however, only has one. The flexor tendons in the digits have a different purpose. The deeper-set flexor digitorum profundus tendon flexes the distal interphalangeal joint; the flexor digitorum superficialis tendon (flexor tendon located closer to the surface) flexes the proximal interphalangeal joint. The flexor pollicis longus tendon flexes the distal interphalangeal joint of the thumb (the thumb does not have a proximal interphalangeal joint). Most of the injuries are caused by cuts on sharp objects, but also through falls into broken glass or similar accidents. The flexor tendon may get injured along the forearm but also on the palm side of the digits. Flexor tendon injuries are complicated lesions which more often than not are accompanied by nerve injuries as well. The results of flexor tendon injuries many times remain unsatisfactory to the injured person even if an experienced hand surgeon performed the surgical intervention, since in many cases a normal function cannot be fully restored. This is particularly true for the flexor tendons located in the fingers. An injury to the flexor tendon may easily be overlooked during a first medical consultation. 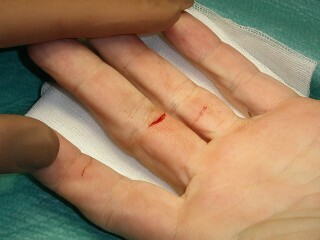 Frequently small cuts in the area of the digits are being mistaken for harmless injuries. The depth of the incision is not always obvious (see image). This injury looks completely harmless on the outside. A simple skin suture applied to the wound would not address the flexor tendon injury at all. The consequence thereof would be the loss of mobility (in this case flexibility) of the finger. The silver-grey structure held by the tweezers seen in this surgery picture show that in the present case the flexor tendon is indeed ruptured. 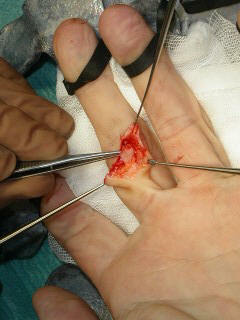 A hand-surgical procedure to restore the severed flexor tendon is mandatory in this case.